We’d love your help. Let us know what’s wrong with this preview of Superbeetle by S. Michele Chen. To ask other readers questions about Superbeetle, please sign up. 8-year-old Hong is visiting her grandma in Taiwan for the first time. It’s not easy for the Californian girl to adjust to the weather, the customs and most of all the bugs. Hong can’t sleep after seeing a black beetle crawling on the wall in her room. She tries to track down the critter and discovers a huge colorful beetle in the bathroom. The beetle is so big, it fills the tub. But unexpectedly Hong isn’t afraid of Superbeetle, she likes it! Superbeetle takes Hong on a journey down the drain whe 8-year-old Hong is visiting her grandma in Taiwan for the first time. It’s not easy for the Californian girl to adjust to the weather, the customs and most of all the bugs. Hong can’t sleep after seeing a black beetle crawling on the wall in her room. She tries to track down the critter and discovers a huge colorful beetle in the bathroom. The beetle is so big, it fills the tub. But unexpectedly Hong isn’t afraid of Superbeetle, she likes it! 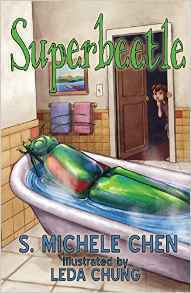 Superbeetle takes Hong on a journey down the drain where she meets the other members of Superbeetle’s family and learns about the rare rainbow click beetle which is on verge of distinction in Taiwan. The discovery changes Hong’s life and saves grandma’s market from destruction. This chapter book aimed at early readers takes the readers into a magical yet real world of American-Chinese little girl. It teaches about people, culture, language, foods and even popular TV shows in Taiwan, and it does so without being preachy. I loved the way Hong expresses her thoughts using different colored post-it, and I loved grandma’s suggestion to use the dumpling’s pancakes when Hong ran out of post-its. It was heart warming to read about Hong and grandma relationship takes form, it’s very subtle. The black and white illustrations are nice and enrich the story while giving the young reader some relief from the plot. This is a chapter book for young readers but I picked it up because I like the author and her short stories. It tells an interesting little story of a young girl visiting her grandmother in Taiwan and how she learns to make dumplings and discovers colorful beetles in the basement. It is simple but sweet and informative about some customs. S. Michele Chen lives in Southern California but visits her family in Taiwan frequently because the bugs no longer scare her (okay, maybe a little bit). She has published numerous crime fiction short stories and a novella under a secret identity. This is her first children’s book and hopefully not her last.